In class we’ve been talking a lot about marking recently. I’ve been trying to make my marking more purposeful and encouraging the children to use it in their personal target setting. During one of our discussions a pupil made a comment that made me think about approaching a task in a back to front way. I explained the task and, before they began, them asked them to help draft some marking comments that I might be able to use on a really good piece of work. I guess it ‘s just a different way of getting them to identify success criteria before they actually start writing. This was what they came up with. This is excellent work because you have put your self in Pandora’s shoes. I can see how she feels during the story – good use of ‘show, not tell’. You made some exciting vocabulary choices and I can see you used a dictionary. You have used punctuation correctly and presented this work neatly. Interestingly, this is the final revised version that we agreed on. Initially it started with the comment about presentation. Sometimes it seems hard for the children (and some adults) to separate content from presentation. Is neat work always good quality work? Of course it isn’t, yet so often it seems to be perceived as ‘better’. 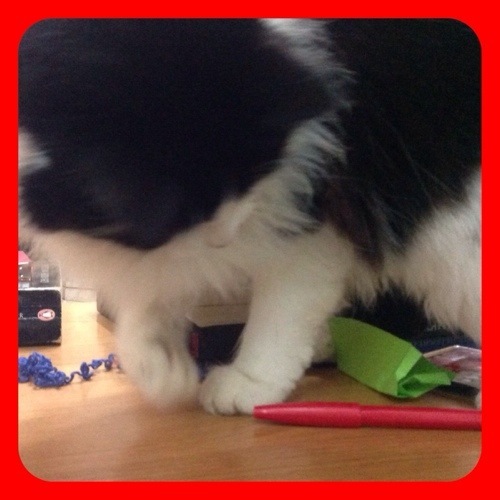 I’ve just had to confiscate a red pen from the cat – perhaps I could out-source my marking.